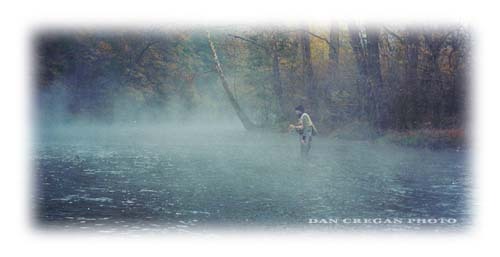 Tulpehocken Creek is a beautiful tailwater fishery located just outside of Reading, Pennsylvania. In 1978, the Army Corps of Engineers constructed a dam on the Tulpehocken Creek thus creating Blue Marsh Lake. The dam is managed as a flood control project and is also used to regulate salinity in the Delaware River Estuary in summer months during low water periods. The dam, which is bottom-release, discharges cool and fertile water from depths of up to 50 feet. This gives the Tully the cool shot of water needed to make it a thriving cold-water resource and home to numerous trout. Brown and rainbow trout between 12-14 inches are the norm in the Tully. The Tully is also influenced by two tributaries, which help keep the lower stretches of the stream cool even during the hottest summer months. Plum Creek enters the Tully just below Rebers Bridge. This provides a nice shot of cool water and for small stream enthusiasts, an interesting diversion to the Tully during certain times of the year or when the Tully is not fishable due to high water. Cacoosing Creek provides an even greater boost of cooling water, joining the Tully near the junction of Tulpehocken Road and Paper Mill Road. The Cacoosing adds a good volume of 55 to 60 degree water to the Tully and can also provide a fishing alternative if the Tully is running high. Tulpehocken Creek is float stocked with 6,000 fingerling brown and 6,000 rainbow trout every fall. These fingerlings grow quickly with trout averaging 8-10" by the spring. Tully holdover brown and rainbow trout average 13-16" inches with a few over 18" caught every year. The Tulpehocken Creek is larger than most southeastern Pennsylvania streams with sections of the stream exceeding 120 feet wide. Wading on the Tully is generally pleasurable compared to most streams of its size. As always, care should be exercised in unfamiliar water or during periods of high water created by heavy flows from Blue Marsh dam. It's important to check the flow rate from the dam before venturing to the stream. Check the USGS website for stream flows. We generally prefer a flow of 350 cfs or less from the dam. Anything more and it can be tough. Caddis are the staple diet of Tully trout. A wide variety of Caddis species will hatch in tremendous numbers that bring up even the largest browns and rainbows. As far as mayflies, sulphurs, Light Cahills, Yellow Drakes, Cream Drakes, Caenis are present but not in great numbers. However, the Blue Winged Olive hatch in the fall and the Tricos, which make their presence usually around the end of June/early July, are by far the major mayflies. In the early years of the Tully's existence the Trico spinner falls were a sight to witness. Virtually a blanket of tiny mayflies (size #24) would cover the water. Due to water quality issues in Blue Marsh Lake this hatch has declined in intensity, but still provides consistent action. Midges also play a role in the Tully trout's diet. These flies are always present on the stream and even offer dry fly fishing on sunny days throughout the winter. Terrestrials can produce during the summer and into the fall. 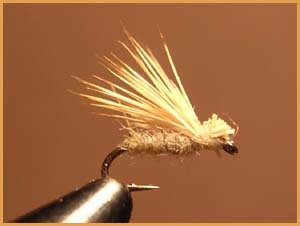 Caddis very often run small on the Tully. Pictured above is a size 18, tan elk hair. The upper reaches of the tailwater fishery begin at the dam/stilling basin and picnic area. Downstream from here are the first of six deflectors marking the beginning of the special regulations, Delayed Harvest Artificial Lures Only area, which extends downstream for 3.8 miles. The deflectors were erected by the Tulpehocken Chapter of Trout Unlimited primarily to control water flow, but they also provide great habitat for trout in this stretch. The TU Chapter also placed a few fish houses in this section, which provide some cover for the fish. The "water works" section is located just below the stretch of deflectors. This section of the Tully is characterized by a series of medium gradient riffles, some pocket water, and long flat glides. The water works receives a great deal of angling pressure every year, and for good reason. Many holdovers are caught in this stretch and access to the water is very easy. The palisades flat and palisades riffle lies just downstream from the water works. This is another popular and productive stretch. The palisades flat is a long deep glide that can be very productive or very frustrating. Fish in the palisades flat have a long time to inspect your offering. This can present additional, and sometimes insurmountable challenges for already selective and finicky trout. The palisades riffle is actually a series of pools, riffles, pocket water, and bedrock ledges that extends downstream about 200 yards. Fish rise freely to caddis in this section and can also be found sipping sulphurs at dusk in late May. The section of the Tully above Rebers Bridge offers a series of slow riffles and pools with good numbers of rainbow and brown trout. The pools above Rebers Bridge offer some of the best summer trico activity on the stream. Fish often-feed in pods and become competitive and careless while feeding on the tiny mayfly spinners. The section of the Tully just below Rebers Bridge is characterized by riffles and pocket water and is influenced by the cool waters of Plum Creek. Good numbers of rainbow and brown trout are also found here. 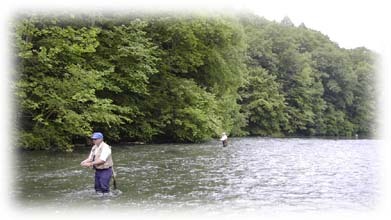 The refrigerator hole just down stream is named for the unique man-made structure that provides cover for Tully trout. This section of the stream offers good fishing to caddis, sulphurs, tricos, and Midges. The paper mill flats are where the locals go to get a quick gauge of stream activity. If the trout of the paper mill flats are not rising, many anglers pull out their strike indicators and expect to prospect with caddis pupa and beadheads. This is rarely the case however; the trout in the paper mill flats are usually rising even in the dead of winter. Just below the paper mill flats the Cacoosing Creek enters the Tully with a burst of cold water and helps to form the paper mill pool. Some of the largest trout caught on the Tully are found in this pool near a bridge abutment and in the riffle where the Cacoosing enters the stream. Fishing in this stretch can also be productive year round with dry fly and subsurface patters. Beadhead caddis, caddis pupae, sulphur nymphs, and small midge pupae are consistent subsurface producers. The Tully is a stream located in the highly populated region of southeast PA. Therefore it receives a lot of angling pressure. If it were not for the Delayed Harvest regulations and many anglers practicing catch & release during the harvest period, the trout populations would not be what they are today. These trout populations allow many anglers to enjoy a quality experience on the Tully. 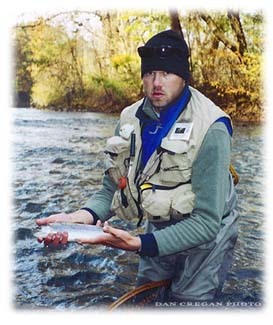 If you fish the Tully we advocate care to the trout and a quick release even during the open harvest period.